The Mojos were one of the few Merseyside groups to be signed to Decca. They had originally called themselves the Nomads and still had Adrian Wilkinson on lead guitar at the time they cut their first single, becoming the Mojos. He was soon replaced by Nicky Crouch, who had previously played with a group called Faron's Flamingos who had themselves cut two unsuccessful singles on the Oriole label. After their first single failed to chart the Mojos departed for Hamburg following the trail well worn by so many UK rock and roll bands of the period. While they were actually in Germany they cut their second single. 'Everything's Al'right' which was penned by the group themselves. The record became the group's only top ten hit. The EP shown here on the right (DFE 8591) has become a real collector's item so if you have a copy then take good care of it. Although one of the tracks it contains is relatively easy to find on a single, it is the only way to find the other three tracks on a UK released 45- as far as I know. 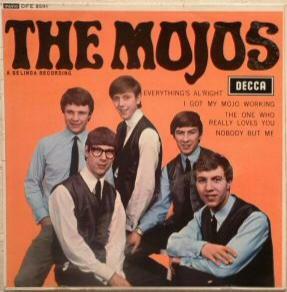 The Mojo's next single, written by their pianist O'Toole, and its follow up both made the chart. However only the first hit comes near to capturing the excitement of their live act. At the end of 1964 the group's line up changed dramatically, losing Keith Carlson (bass), Terry O'Toole and John Conrad (drums). However they continued to record as a four-piece benefitting from the addition of a new drummer, Aynsley Dunbar and a bass player called Lewis Collins. None of the band's subsequent recordings sold very well including one attributed to 'Stu James and the Mojos', and it finally broke up in January 1967. Lewis Collins became a professional actor and is best known for his part in the TV series 'The Professionals'.